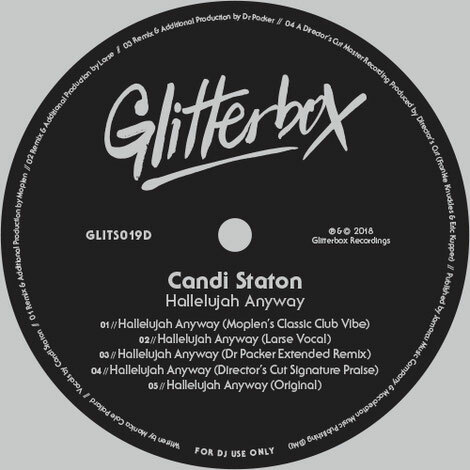 Moplen, Larse, Dr Packer and Director’s Cut, aka Frankie Knuckles and Eric Kupper, revamp Candi Staton’s popular gospel track ‘Hallelujah Anyway’ for the Glitterbox label. Italian producer Moplen maximises the uplifting vocal in his ‘90s-house-influenced 'Classic Club Vibe' mix. Larse touches deeper territory in a mid-tempo 'Vocal' rendition and Dr Packer re-introduces a disco beat in his indulgent piano-littered remix. Director’s Cut pick up the pace with soaring synths and a grooving beat, taking the track firmly back to the dancefloor in their 'Signature Praise' version. Finally, the 'Original' version completes the bundle.